Damaraland is beautifully arid and spectacularly unforgiving! One of the most scenic places in Namibia, in the height of the dry winter or the rains of summer. Here you find unique experiences, attractions like Burnt Mountain, Rock Art at Twyfelfontein and geological wonders like the Petrified Forest. It is also home to the local tribe of Himba people still living and dressing to ancient traditions. 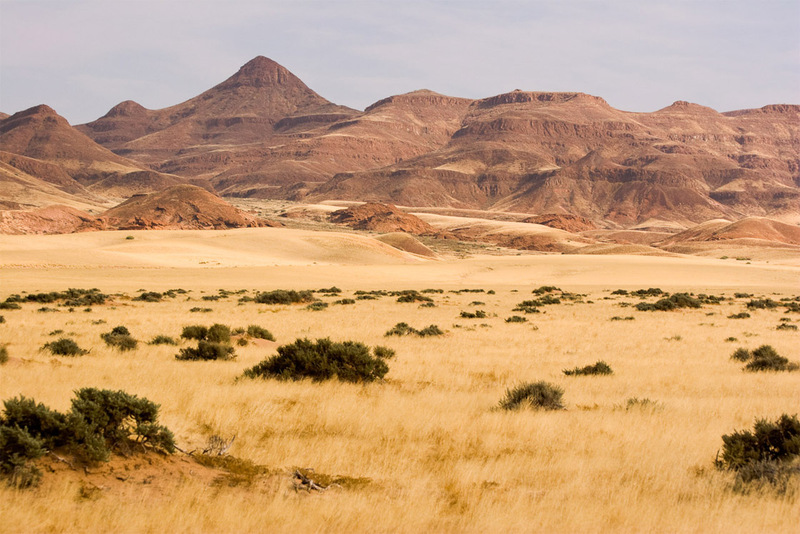 Damaraland is vast and awe-inspiring. Whether flying in or self-driving through it works as a stopover destination between the Etosha Pan and the coastline. We have put together some fabulous suggested itineraries for Namibian vacations. Whether on a family holiday, dream Honeymoon, or Safari adventure this destination works wonders for the soul. Desert adapted wildlife is a highlight. Driving through heat and inhospitable terrain it is difficult to comprehend that animals actually live here. Desert adapted elephants have been known to cover as much as 200km in search of water. Tracking desert Rhino is an adrenaline adventure! Accommodation in Damaraland generally takes advantage of the unique environment. Places like Mowani Mountain Camp wedged between ancient boulders with breathtaking views. Wilderness Safaris operates Damaraland Camp for amazing expeditions to find the desert adapted elephant. Skeleton Coast Camp for an experience all in! For the remote nature of these camps there are no luxuries missing! Activities are abundant in Damaraland. You can choose to do it yourself on a self-drive tour or you can sit back and absorb it all while one of the experts guides you! This is a fascinating area where having knowledgeable guides really rewards. If you chat to one of our consultants they will be able to recommend the appropriate itinerary for you. Whether you are interested in your own self-drive adventure, a fly-in circuit, activities or amazing scenery – Damaraland is a wonderful African safari choice everytime.